As the saying goes, everything is bigger and better in Texas. And that holds true for the Texas Medical Association. More than 50,000 physicians and medical students have chosen to be members of TMA. If you're new to Texas, use TMA's one-stop location for information on the licensure process, physician demographics, credentialing application, establishing your practice, state and federal agencies, resources for your practice and much more. Gov. Greg Abbott signed the MOC bill into law. Find out why it’s an expensive, time-consuming process that many physicians believe offers no value to them or their patients. It was supposed to be a benign medical board order caused by some minor missteps. Instead, without warning or a chance to argue his case, a Texas subspecialist in an underserved area lost his board certification. Sound like an anomalous nightmare? It might be — but it also could be that your certifying board has more discretion than you realize to review or even revoke your certification based on the slightest disciplinary action. In comments to the Sunset Advisory Commission on its 2016–17 review of the Texas Medical Board (TMB), TMA says one important matter is disappointingly absent from the agency's thorough and detailed report: improving TMB's disciplinary process. While TMA generally supports the sunset staff's report, the association says more could be done to ensure effective operations at the medical board. “Is government giving us our money’s worth?” The Legislature relies on the Sunset process to regularly shine a light on state agencies and programs to see if they are still relevant in a changing world, and if so, how they can do their jobs better. The Interstate Medical Licensure Compact offers a new, voluntary expedited pathway to licensure for qualified physicians who wish to practice in multiple states. 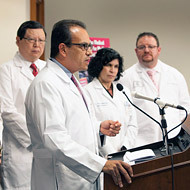 Despite significant improvements to the Texas Medical Board's disciplinary process over recent years, some physicians still complained about how the board treated them. The Texas Medical Association heard those complaints. Most physicians strive to maintain the highest of standards by practicing good medicine and behaving professionally. But if you find yourself the subject of a TMB investigation, you need to understand how your responses and actions throughout the process will affect you now and in the future. Find out if you are eligible for a Texas medical license and what it takes to maintain it. Got Licensure questions? Call the Knowledge Center.